UMass recruits Kevin Boyle and Chris Delmauro have both been named to the Atlantic Junior Hockey All-Star Roster. They’ll suit up for the South team in the game taking place in Walpole on Sunday, January 31st. Colin Shea meanwhile played in his second Eastern Junior All-Star Game yesterday in New Hampshire. His North Team lost the contest in overtime. UMass has been recruiting Canadian goaltender Joel Vienneau from Kingston of the OJHL. Though he has already visited campus the odds of landing him are not good as he has also received an offer from Minnesota and his father says he’s “95 to 99 percent” sure he’s going there. In addition he’s being recruited by St Lawrence and Lake Superior State. Vienneau is 21-3-0-2 for the Voyaguers with a 2.09 GAA and .930 save percentage. He is tops in his league in both those categories. He’s also ranked 29th among North American goaltenders in the NHL Draft mid-term rankings. The Collegian staff is back from break and writing about hockey again. They have one piece recapping the Minutemen’s bi-polar winter break effort while this effort talks about some of the struggles the team is working to overcome. Paul Dainton was named Co-UMass Athlete of the Week along with Track and Field athlete Lisa Wilson. Assistant Coach Red Gendron will be speaking at the Washington Capitals College Hockey Fair late in March. I also noticed that Red was not in attendance for this weekend’s game at Lowell, perhaps out on the recruiting trail instead. With David Boehm’s departure that opens up a slot for another forward to potentially come in next season or perhaps a current commit will come to campus a year earlier. Recruits this late in the process can end up being impact-type players. Just look at Casey Wellman. College Hockey News is doing a two-part feature on the top stories of the past decade, here is part one. Here is part two. UMass football star and potential first round NFL draft pick Vladimir Ducasse is doing what he can to aid those in his native Haiti. Lastly, I wanted to address something quite serious and disturbing I witnessed at the Tsongas on Saturday. Of course, I am always delighted to see UMass fans wear their triangles to support the team at the games. 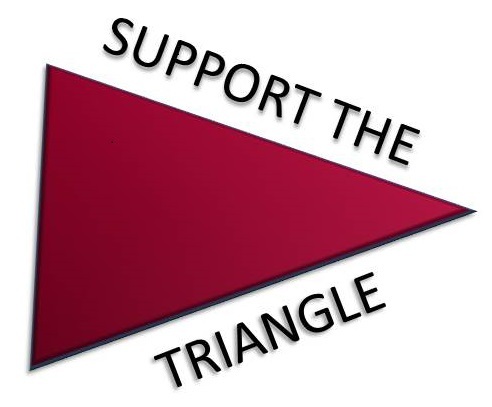 However, let it be known that the author of this blog, which celebrates the greatness of the triangle, disapproves with great vigor the wearing of a triangle jersey together with a Boston College hat. This is simply unacceptable and I would rather see said triangle put to flame than disgraced in such a fashion again. That is all.